Discover the natural beauty and fresh seafood of the Marlborough Sounds during a 3.5-hour cruise from Picton. Travel by luxury catamaran through the sheltered waters of the Queen Charlotte Sound, located at the top of New Zealand's South Island. Taste fresh seafood served on board and paired with a glass of Marlborough Sauvignon Blanc. You'll also learn about aquaculture in the Marlborough Sounds, check out a salmon and mussel farm, and get great photo ops of the region. Make your own way to the Picton Marina in the early afternoon to board your 65-foot (20-meter) luxury catamaran. Picton is located at the top of the South Island, near the head of the Queen Charlotte Sound and just 25 minutes north of Blenheim. Get comfortable on one of the outdoor decks or in the cabin, which has booth seats with tables, and lounge areas. Take in sweeping views of the the scenic waterways of the Sound as your captain takes you to salmon and mussel farms along the route. The crew serves up samples of fresh seafood from local sources (typically steamed greenshell mussels, king salmon and Cloudy Bay clams) accompanied by a glass of Marlborough Sauvignon Blanc wine. Hear informative commentary about the region from your captain during the cruise, and keep an eye out for possible sightings of wildlife such as penguins, dolphins and seals. A range of light snacks, hot tea and coffee, Marlborough wines, beer, juice, and bottled water are available for purchase on board. Your 3.5-hour tour ends with return to the Picton Marina in the early evening. This was the most memorable experience of our trip to New Zealand. The boat was comfortable. The crew was super friendly. The wine was delicious. However, the seafood experience was indescribably delicious. The Green Lip Mussels were the size of my palm. Really, they were huge. They were tender and delicious. The smokes salmon we had was the best I have ever had in my life. 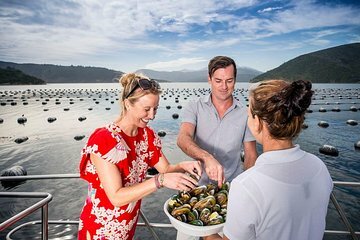 It was very educational to tour the mussel beds and salmon farm coves in the beautiful waters off Picton to see how New Zealanders are committed to sustainable seafood and protecting the environment. Even the waters in the main harbors in Wellington and Picton were both so clear you could see the bottom. This country recognizes the asset their environment represents and they are passionate about joyfully sharing it and protecting it. This tour was worth every penny and I will do it again anytime we visit Picton just to re-experience it again! 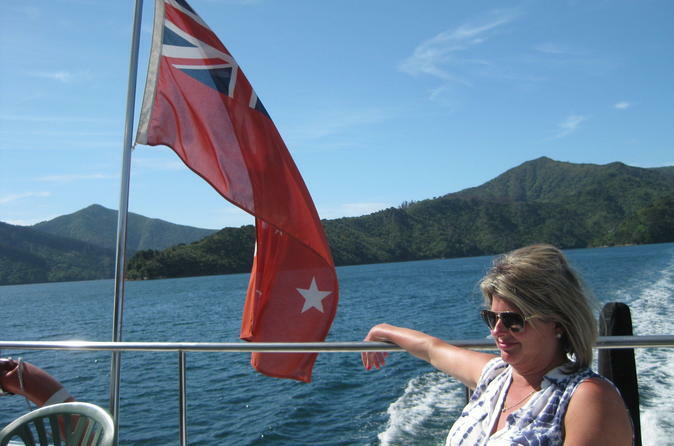 The advert says: Glide through Queen Charlotte Sound and listen to the captain's informative commentary on the region. Includes samples of fresh local seafood paired with a glass of Marlborough sauvignon blanc wine. The tour delivers exactly what it promises, and more!! !